Royal Caribbean Cruises, Bygg nr. 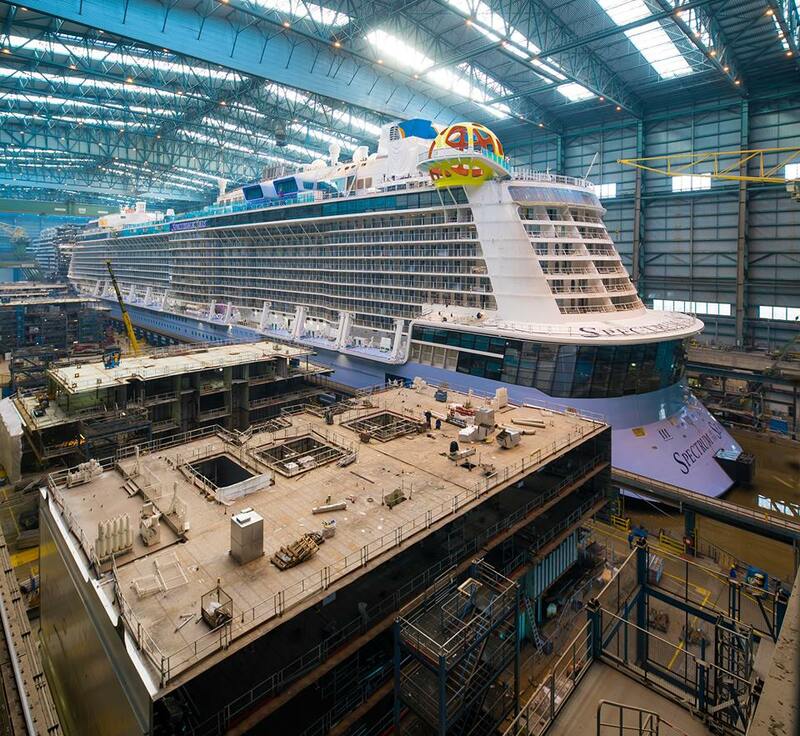 700 & 713 ved Meyer Werft, 169 000 GT Cruise Ship "Spectrum of the Seas" & "Odyssey of the Seas"
MIAMI, August 15, 2017 – Excitement was in the air today at the Meyer Werft shipyard in Papenburg, Germany, as Royal Caribbean International marked the official start of construction by cutting the first piece of steel for its new Quantum Ultra ship. 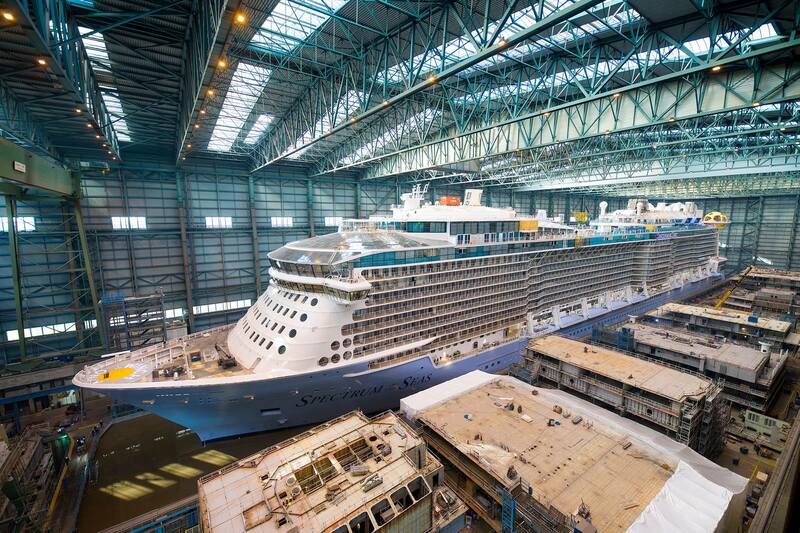 The next engineering marvel in the innovative cruise line’s lineup will officially be named Spectrum of the Seas. Set to debut in 2019, Spectrum will be the next evolution of the cruise line’s groundbreaking and high-tech Quantum class of ships placing the ship in a new class of her own. The revolutionary Quantum Ultra ship will specifically be designed for guests in China and the Asia-Pacific region, and will feature cutting-edge and unprecedented experiences and amenities. Hamburg based towage company Bugsier has been awarded to tow a hull-section, more precisely the engine room section of the “Spectrum of the Seas” from Warnemünde (Neptun Yard) to Papenburg (MEYER WERFT GmbH & Co. KG) via Kiel-Canal. The strict and defined technical conditions set for this sophisticated towage required a mix of highly maneuverable and versatile propulsions (Voith Schneider and a Rotortug). Bugsier has chosen respective tugs out of the fleet of the Fairplay Towage Group. The entire towage was performed under the supervision of a Bugsier employed tow master. The convoy will reach Papenburg today. Royal Caribbean Cruises Ltd. (NYSE, OSE: RCL) today announced that it has entered into an agreement with Meyer Werft in Germany to order a fifth Quantum-class ship for delivery in the Fall of 2020. Fra bygginga av "Spectrum of the Seas"
Den andre av desse, altså bygg nr. 713 får namnet "Odyssey of the Seas"
The Spectrum of the Seas will probably be leaving the covered building dock II at the MEYER WERFT on 25 February 2019. The ship has a rating of 169,300 GT and measures 347.75 m in length and 41.4 m in width, with ca-pacity for 4,188 passengers. The ship built for the American Royal Caribbean International shipping company will start to leave the dock at around 8 p.m. Once the Spectrum of the Seas has left the dock, it will berth at the shipyard's out-fitting pier to be fitted with its funnel cladding. Weather permitting, the North Star (glazed viewing capsule) will also be installed on the ship. 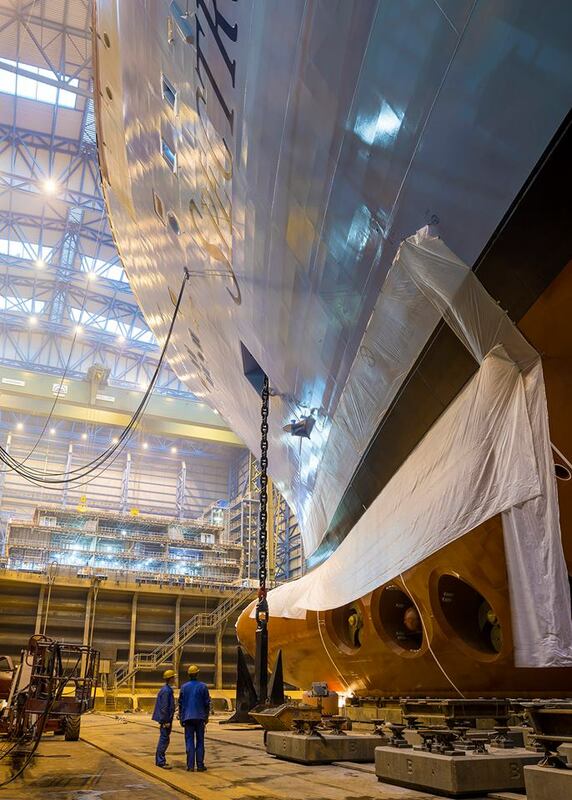 The ship will then remain in the shipyard port for further out-fitting work and on-board trials until its passage through the river Ems up to the North Sea, which will probably take place mid March. For the Spectrum of the Seas to be able to berth at the out-fitting pier, the floating section (engine room unit) of the Norwegian Encore that is currently moored here will have to be moved to another berth in the shipyard port. 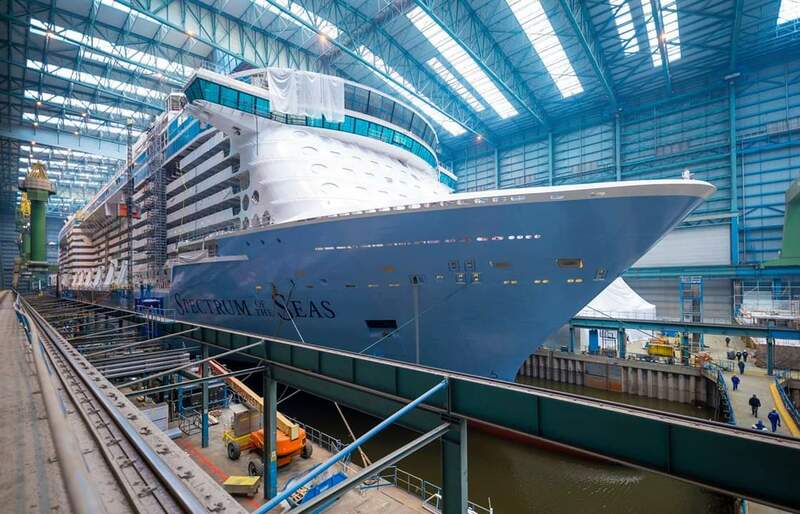 Once the Spectrum of the Seas has left the dock, the floating part for the Norwegian Encore, which is due for completion in autumn 2019, will be manoeuvred back into the free covered building dock II for further construction work. All times are subject to the weather. 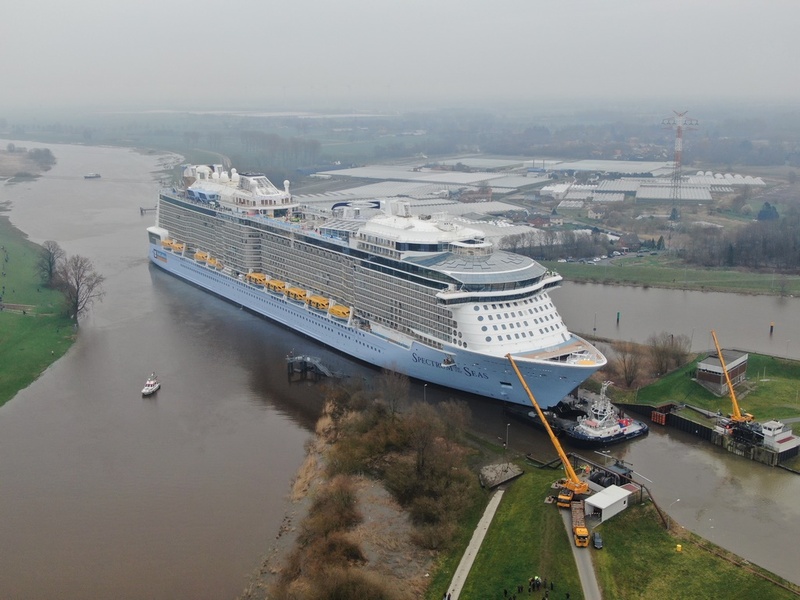 The new cruise ship for Royal Caribbean International (USA), Spectrum of the Seas, will probably leave Papenburg on Tuesday, March 19 2019 to be conveyed on the river Ems to Eemshaven (Netherlands). The ship is planned to arrive in Eemshaven on Thursday morning. Later on the ship will go through several days of technical and nautical sea trials on the North Sea. Once again, a team of river pilots from Emden will be responsible for manoeuvring the ship to Eemshaven. The pilots on the river Ems also looked after the MEYER WERFT ships during their passage to the North Sea in previous years. The whole team trained the conveyance at the computerised simulator in Wageningen (Netherlands) to be better prepared for the task. Spetrum of the Seas will proceed in reverse up the river Ems to the North Sea. This approach has proven successful in the past as it makes it easier to manoeuvre the ship. Two tugs will be providing assistance in the process. The cruise ship with 169,300 GRT is one of the largest cruise ships to be built in Germany with capacity for about 4,284 passengers. After completing the technical and nautical sea trials on the North Sea, the ship will be handed over to the owner early April 2019. 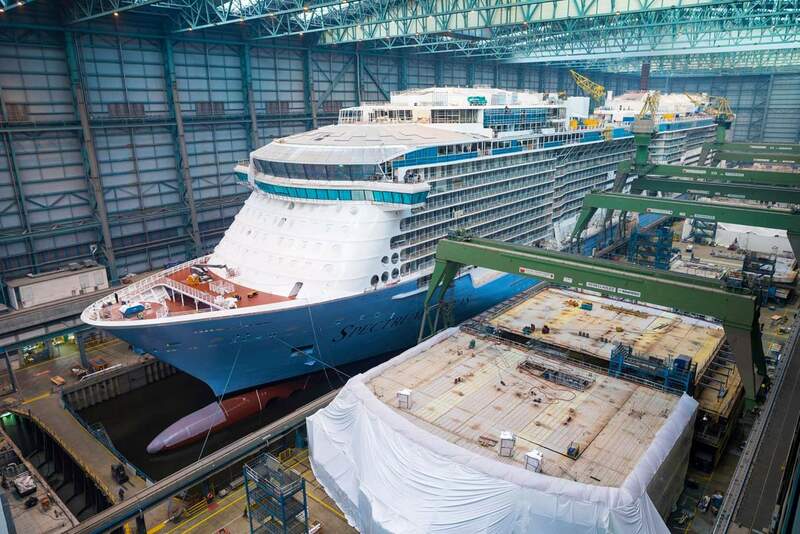 Meanwhile, MEYER WERFT continues to work flat out on other ships: building dock II currently houses the Norwegian Encore which is scheduled to be completed in autumn 2019 for Norwegian Cruise Line (USA), while Spirit of Discovery gets completed in building dock I. The ship for Saga Cruises (UK) is scheduled to be delivered in summer 2019.